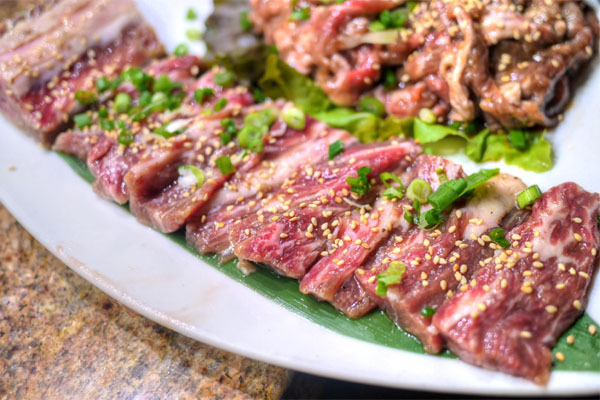 When it comes to top tier Korean BBQ in LA, Genwa's one of the names that often comes up. 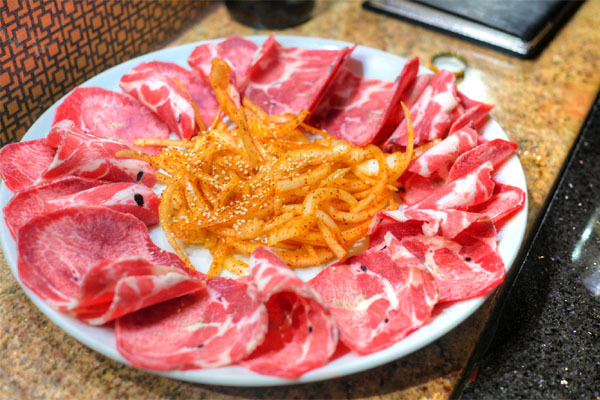 Opened in March 2008 by Jay Kwon, the restaurant's located, unconventionally, in Hancock Park, not Koreatown, but that doesn't seem to be a detriment to its popularity. For those relegated further west, there's also a second location inside the old Woo Lae Oak space in Beverly Hills that debuted in June 2013. 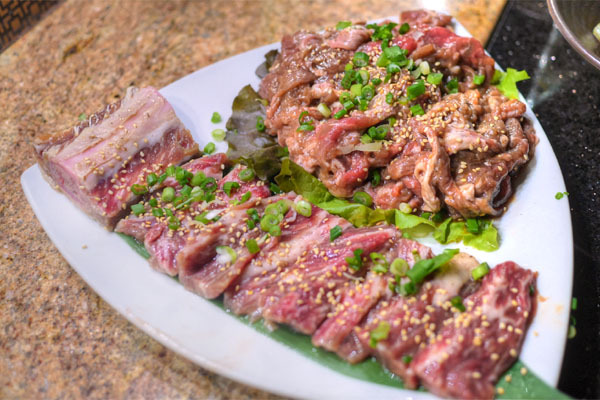 As for Genwa's menu, you get a nice variety of beef cuts joined by a large array of other traditional Korean dishes, though the place is surprisingly light on pork. Click for larger versions. Drink-wise, the selection here is definitely better than most, with the standards of soju and beer joined by cocktails and the largest wine list I've encountered at a KBBQ joint (replete with baller Champagnes). Click for larger versions. We negotiated a fixed corkage fee of $40, so we had at it with the beers. 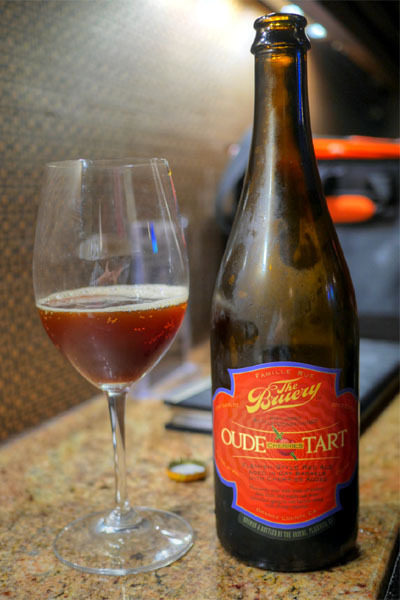 I started things off with a sour: the 2013 The Bruery Oude Tart with Sour Cherries, an oak-aged Flemish-style red aged, unsurprisingly, with cherries. It was as tart as you'd imagine, with dark, oaky, funky, vinous flavors and a bracing acidity to it. Puckering, but without too much actual cherry flavor in there. Genwa is well-known for the galaxy of banchan they bring out, and tonight we enjoyed 22 varieties (clockwise from lower-left): pajeon (scallion pancake), kongjorim (soybean), ueong jorim (burdock root), gaji namul (eggplant), cheonsachae (clear kelp noodles), gyeran mari (rolled egg omelet), doljaban muchim (seasoned seaweed), dubu kimchi (tofu with kimchi), hobak jeon (fried zucchini), some sort of lettuce(?) banchan that I'm not familiar with, ojinguhchae muchim (dried squid), mumallaengi muchim (dried radish), eomuk bokkeum (fishcake), oi kimchi (cucumber kimchi), miyeok julgi bokkeum (seaweed salad), broccoli, pickled radish and jalapeño (not sure of the Korean name), dotorimuk (acorn jelly), baek kimchi (white kimchi), gamja saelleodeu (potato salad), kkakdugi (daikon kimchi), and lastly, good ol' baechu kimchi. 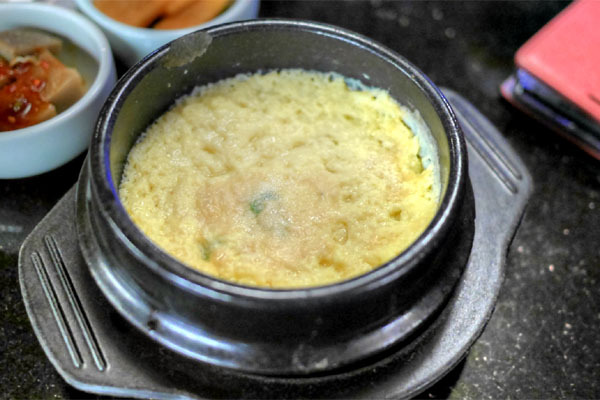 Accompanying the banchan was the gyeran jjim (steamed egg). Fluffy and flavorsome, it was one of the best I've had. 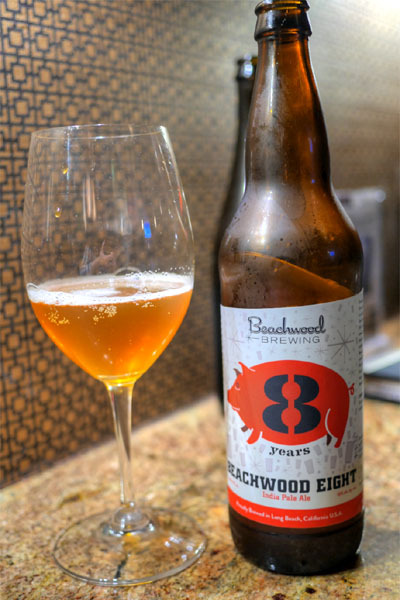 IPA duties tonight were handled by the 2014 Beachwood 8, the brewery's recently released anniversary beer. Made with eight hops--Chinook, Warrior, Citra, Nelson Sauvin, Equinox, Azacca, Belma, Mosaic--representing eight years, it was one of their best double IPAs yet. Think a great mix of pine-y, resinous, tropical fruit flavors on the nose, with a taste that was balanced, complex, and very satisfying, hitting all the right IPA notes. 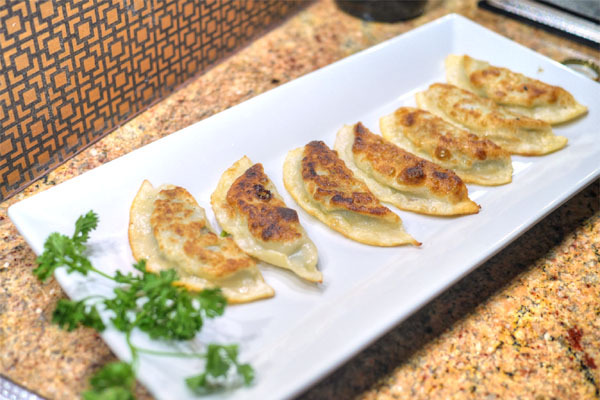 Gunmandu were tasty little bites, with a simple savoriness to 'em and some pleasing textures on the wrappers. Easy to keep popping these. Getting into the meat now, we began with the ubiquitous chadol bagi, which I found more flavorful than most, with a good smoky quality and a nice bite. 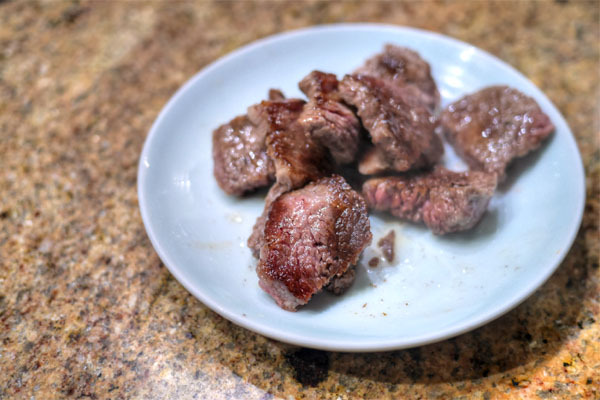 Tongue is one of my favorites items to order, and didn't disappoint tonight, coming out earthy and well-charred, with just the right amount of chew. 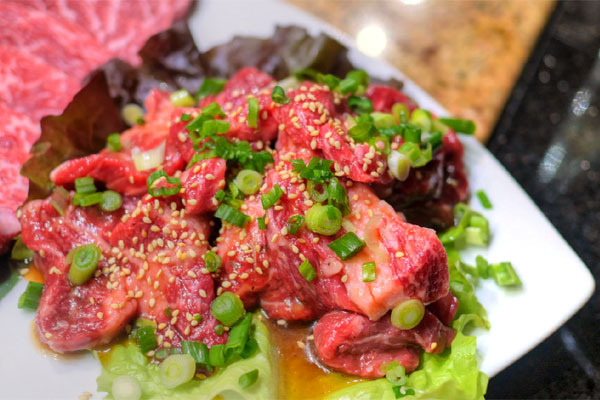 Particularly good with a dab of sesame oil. This entire dinner actually came about initially as an excuse to drink all of Firestone Walker's 2014 Proprietor's Vintage beers in one sitting. 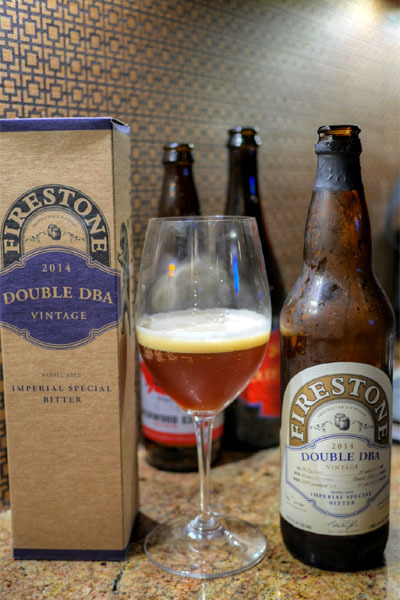 As such, we kicked off the series with the 2014 Firestone Walker Double DBA, their barrel-aged imperial special bitter that's actually being discontinued (this was the last bottling). Arguably the lightest beer of the bunch, it was a good way to commence. Notes of sweet coffee and bourbon on the nose led to flavors of malt, caramel, biscuit, vanilla, and coconut, with just a bit of heat toward the end. 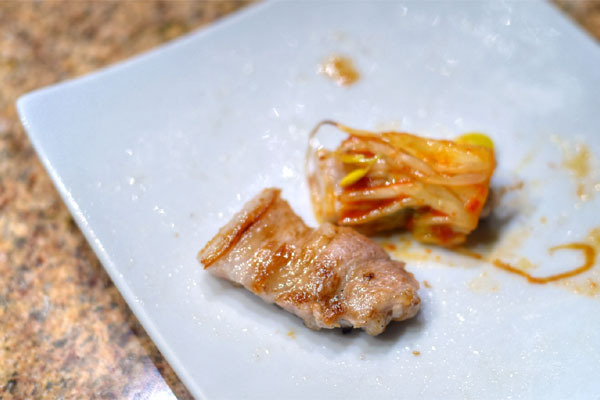 I'm a sucker for haemul pajeon, and Genwa's was quite possibly the best I've had, a seafood-forward presentation well-laced with scallion and underscored by a superb spiciness. 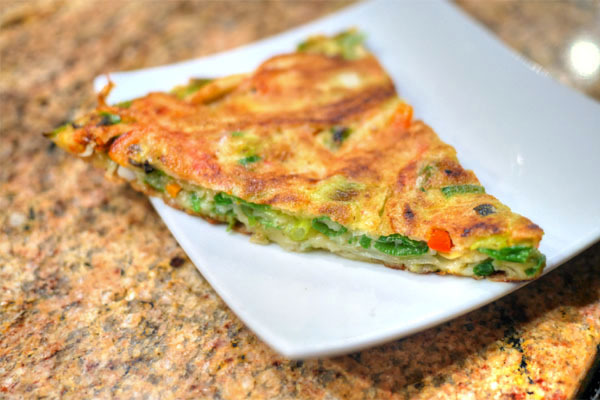 Note that what's pictured above was only an eight of the total pancake. 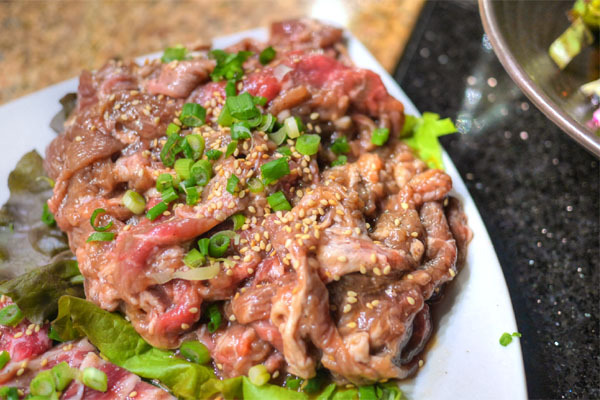 At this point, we ordered one of Genwa's combos, which included the following: House Salad, Choice of Dwenjang Jigae or Kimchee Jigae or Bibimbap, Kot Sal, Joo Mul Luk, Prime Galbi, Bulgogi, and Soju (which we replaced with a bibimbap given all our beer). 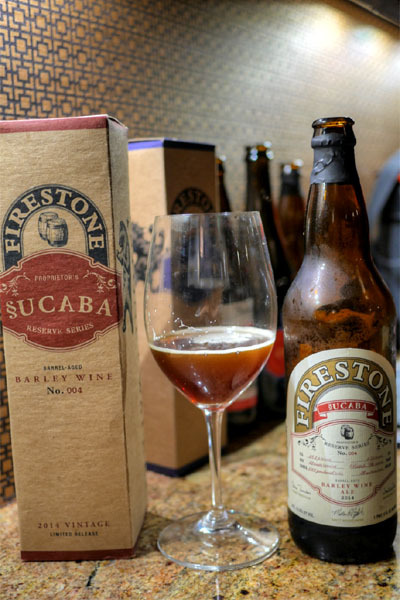 Next to drink was the 2014 Firestone Walker Sucaba, a barrel-aged English barley wine. One of the brewery's most famous beers, this didn't let us down, with loads upon loads of dark fruit, malt, and chocolate on the nose, while the palate gave us more fruit, more malt, and plenty of barrel and bourbon character. 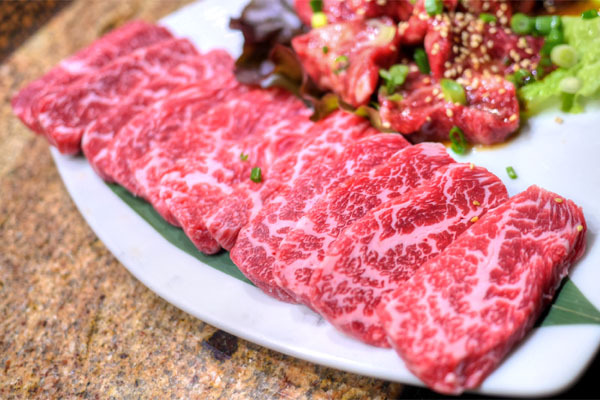 Kkot sal is always a tasty one to eat, a beautifully-marbled cut that was delicate in flavor, with a good amount of char and a supple, yet satisfying consistency. 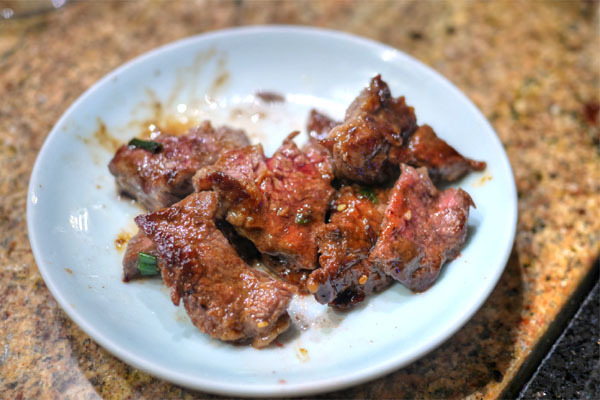 Coming out marinated, jumulleok was particularly juicy, with a deeper, more intense sort of bovine goodness. 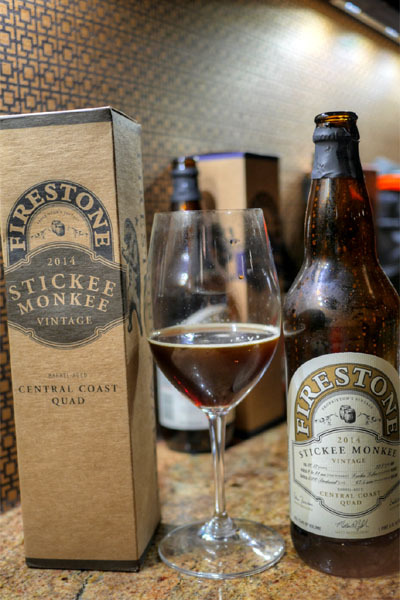 Billed as a Central Coast quad, the 2014 Firestone Walker Stickee Monkee was brewed with Mexican turbinado brown sugar and aged a year in bourbon barrels. As a result, there was a huge, huge candied aroma on this one that I really enjoyed. 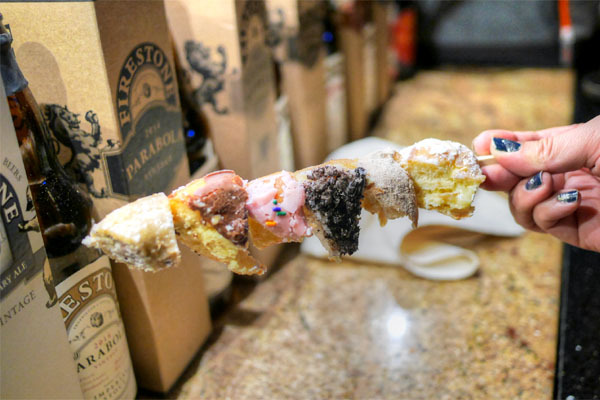 On the tongue, it was all about molasses, brown sugar, malt, oak, and sweet coconut. Damn tasty. A duo of stews formed natural accompaniments to all that meat. 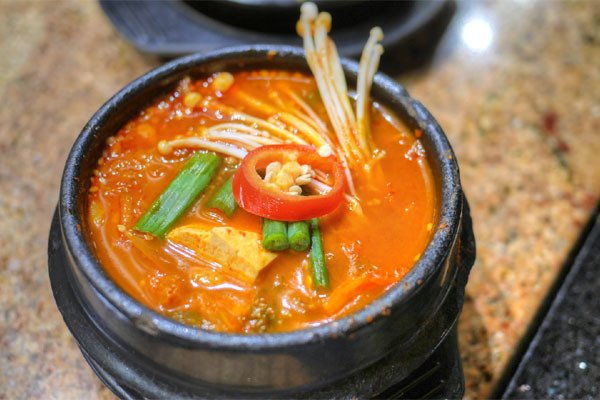 The kimchi jjigae was all that you'd want from it, spicy and intense, with a nice contribution from the paengi beoseot (enokis). 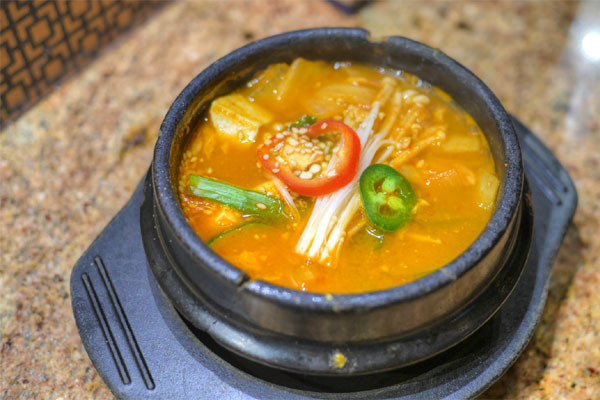 Meanwhile, the doenjang jjigae was a bit more subdued, with a heartier profile from the soybean paste and a comforting beefiness. 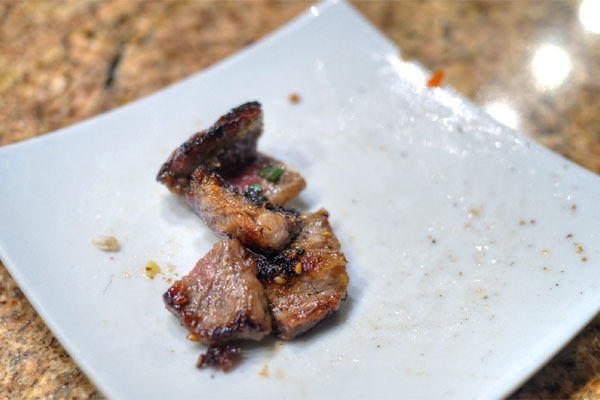 Kalbi came out with a good mix of sweet, char, and meaty flavors. Slightly chewy, but in a gratifying way. 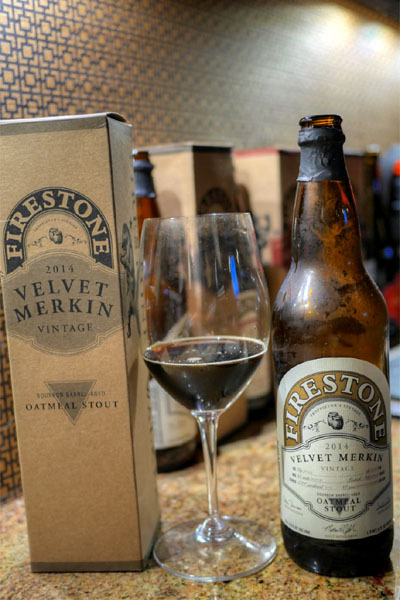 The 2014 Firestone Walker Velvet Merkin, a bourbon barrel-aged oatmeal stout, was the most surprising of the beers tonight. The bouquet was super sweet on this one, teeming with notes of raisin. Unexpectedly effervescent and smooth, it had huge, huge amounts of bourbon character, almost as if there were actual whiskey mixed in. It was probably the most pronounced bourbon that I'd tasted in any beer, though the flavors went well with the brew's chocolate-y base. 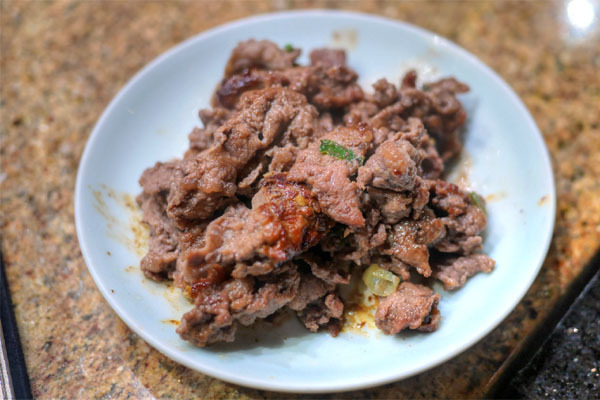 The ubiquitous bulgogi rounded out our combo meats, a sweet-tasting, tender presentation that was certainly the easiest-eating cut of the bunch. 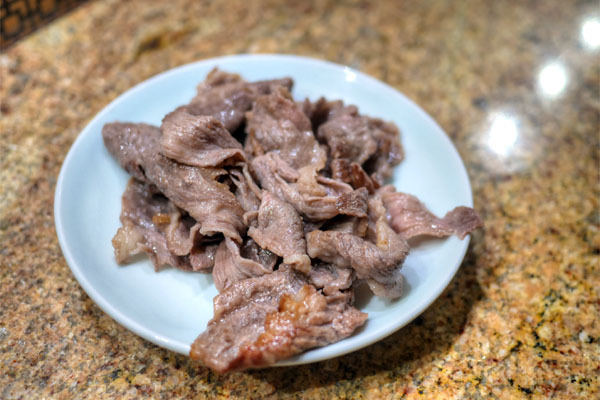 With the beef dispensed with, we had to get some pork all up in this and thus ordered a plate of the samgyeopsal. 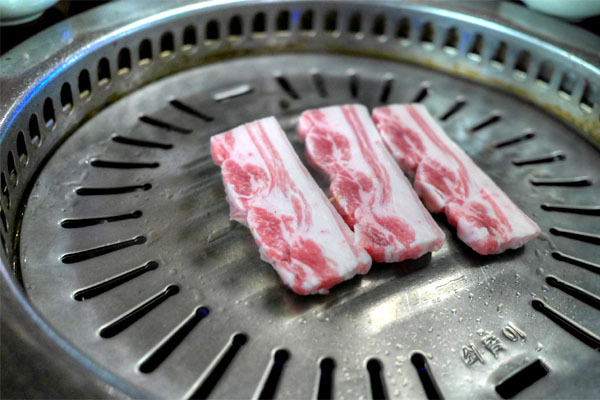 It was a spot on rendition of the belly, thick cut with great piggy flavors, a nice char, and the right amount of fat. 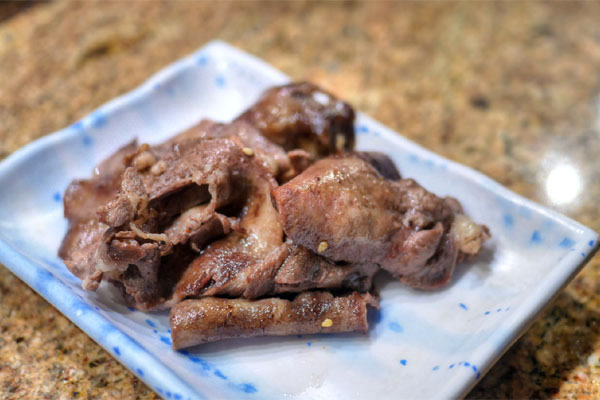 Particularly good with some grilled kimchi. 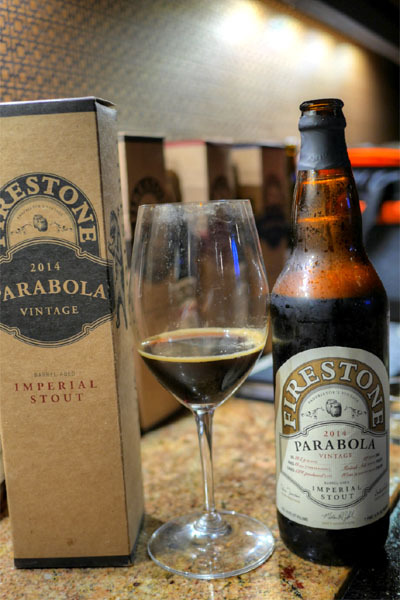 The 2014 Firestone Walker Parabola was undoubtedly the heftiest beer of the evening. It had the headiest aroma, with intoxicatingly rich notes of toffee, molasses, oak, and bourbon, while taste-wise, you got loads of chocolate, coffee, spice, bitterness, and vanilla-laced barrel character. This one lived up to its reputation as one of the top BBA stouts out there. 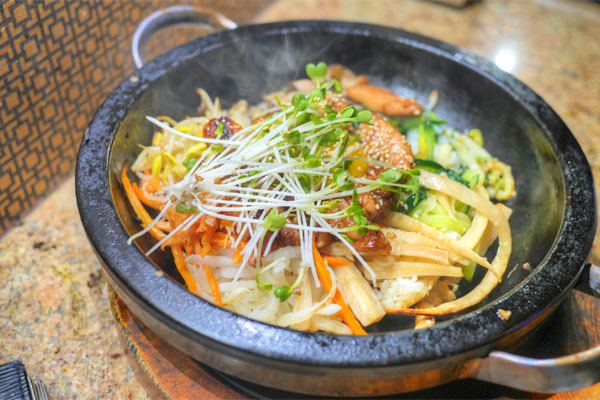 With the meat all eaten up, we tucked into some dolsot bibimbap, a prototypical presentation of the dish with a strong sesame backbone and undertones of spicy gochujang. 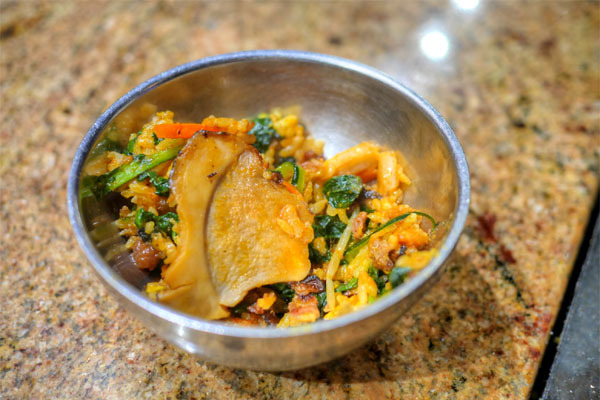 I was particularly fond of the crispy bits of nurungji here. 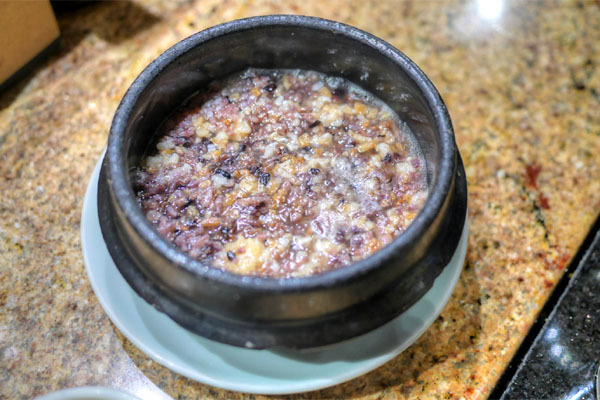 Nurungji was also used at the end of the meal to make a porridge, which I wasn't particularly keen on. 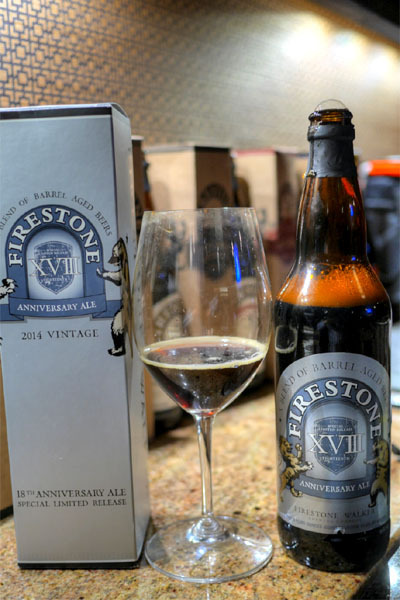 Last but certainly not least was the 2014 Firestone Walker XVIII, the brewery's 18th anniversary ale comprised of 227 barrels of nine different beers, blended together, with Parabola leading the charge at 38%. Not surprisingly, it was the most multifaceted brew, smelling mostly of dark fruit, brown sugar, and chocolate. The taste was fairly restrained, harmonious, with oak, malt, bourbon and more of that chocolate-covered berry fruit. 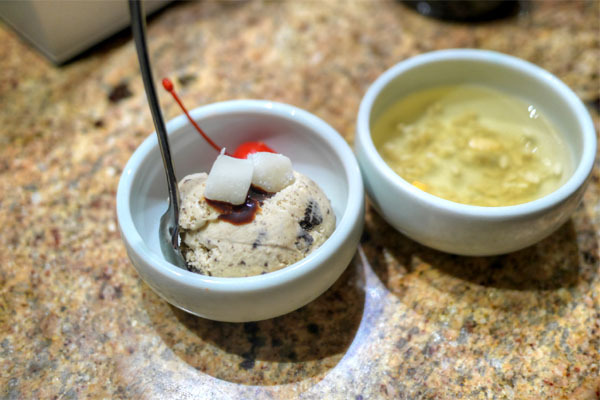 Dessert was composed of an unexpectedly good Cookies 'n Cream-like ice cream (loved the mochi texture here) and a cup of sweet, rice-y sikhye. 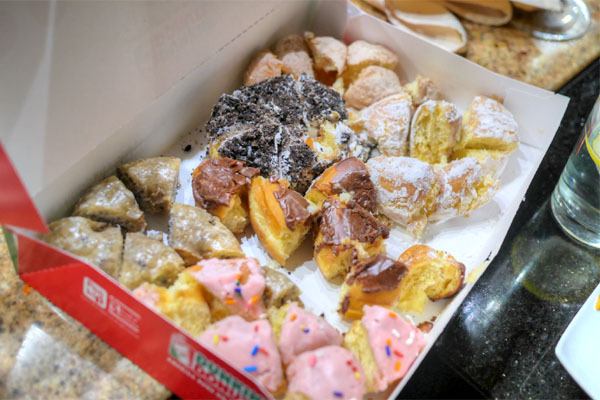 We needed more of the sugary stuff to close, so we busted out some Dunkin' Donuts, which we quickly cut up and skewered. 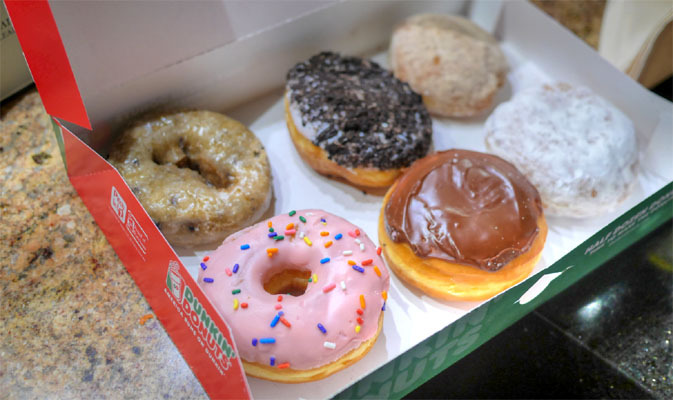 Flavors included (clockwise from upper-left): Blueberry Cake, Oreo, Apple n Spice, Bavarian Kreme, Boston Kreme, and Strawberry Frosted. 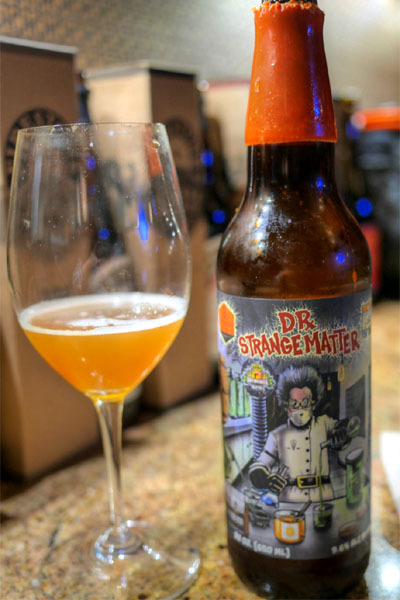 Given how much we drank, I wasn't originally planning to open the 2014 Bottle Logic Dr. Strangematter, but one of my dining companions insisted. A collabo with Iron Fist Brewing for the OC Brew Ha Ha festival, this was a saison brewed with holy basil, pink peppercorn, wild flower honey, and New Zealand Wakatu and Wai-Iti hops, then fermented with French farmhouse yeast and aged in Chardonnay barrels. I found it tart and funky and wine-y, with a surprising weight to it and strong tropical fruit quality and palpable honeyed character, all balanced by a backbone of hop bitterness. 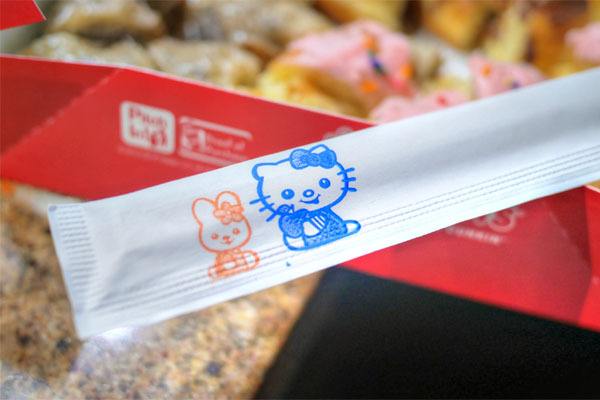 We also noted toward the end of the night that Genwa's chopsticks featured a somewhat disconcerting depiction of Hello Kitty (along with another character that I wasn't familiar with). 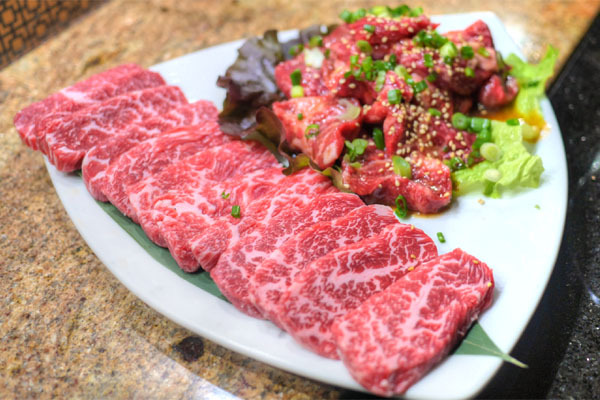 You do pay a premium here, but Genwa delivered food-wise with some quality KBBQ, and all in a comfortable, dare I say fancy environment, with respectable service to boot. No doubt this is one of the better players in LA's gogigui game. 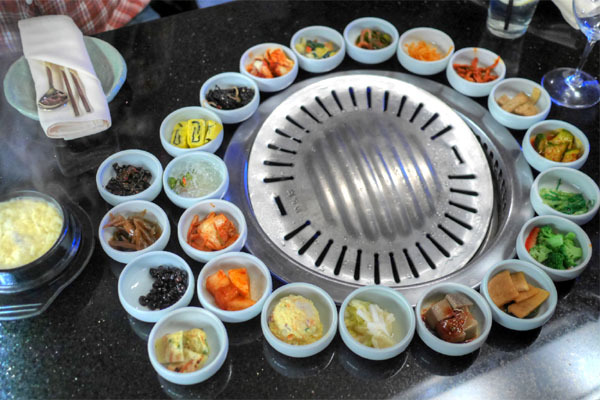 Anyone that picks this place over Park's or Chosun needs a good kick in the nuts. Went to the Beverly hills location, which is where the previous Woo Lae Oak used to be. Smelled funny inside, like chemical cleaning fluids. That was a turn off. Glass noodles and vegetable tempura were outstanding. 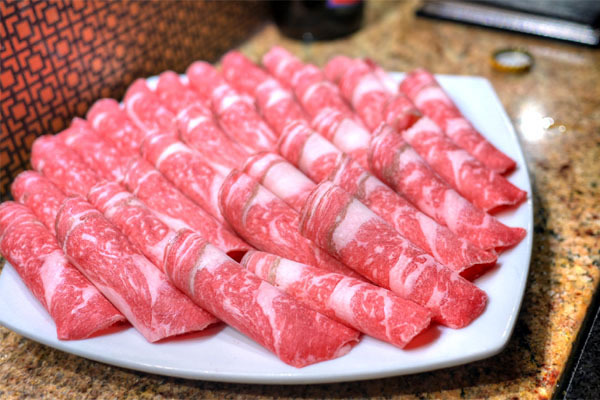 Yook Hwe needed to be marinated - was tasteless. Should have diced cucumber up, not had large strips of it. Location is unfortunate. They need to be in an upscale strip mall like South Coast Plaza to be successful. They won't get vitally necessary walk-ins here for lunch or dinner. It will be bound to fail just like Woo Lae Oak did, simply because of the location.